As many of you have heard, this public realm scheme to improve the pavements in front of shops along Shaw Road and Heaton Moor Road has now been given funding by Stockport Council. This is fantastic news, and we firmly believe this is a great development for the community. There have been some concerns raised on Social Media, and so we thought we would write this article to address those concerns. Like most people, we want to live in a clean and positive environment and help the Heatons to continue developing into a really attractive area to live and work. We thought the scheme which was envisaged and developed by Nick Atherton, an independent resident and business owner, living and working in Heaton Moor with the skills and knowledge to help create such an environment, helped to do this and supported him in developing his ideas. Nick presented his ideas to 4HTA meetings where a lot of support was shown, and so the project was adopted by the 4HTA. We provided a small amount of funding to Nick for specific data such as digital OS basemap information and some printing, which helped him formulate the ideas with some more substance. We took the project to Stockport Council who were also keen on the idea, and somewhat surprisingly, there was some funding available and they were happy to allocate it to this project. Key elements of the project. Streetscape improvements: The scheme will provide wider pavements for pedestrians, a better context to the shops and improvements to the view of buildings and shops along Shaw Road and Heaton Moor Road. The cafes, bars and shops on Shaw Road and Heaton Moor Road are already there and we think they make a significant contribution to the quality of life in Heaton Moor. We want to help them and we hope this project will benefit the character and appeal of Heaton Moor for years to come. The area is in a conservation area due to the high quality of architecture and beautiful buildings which the streetscape does not currently do justice to. Part of the conservation management plan identifies improvements to the streetscape as a priority for the area and securing funding for this in such a short period of time is actually quite an achievement. The new ‘conservation flag’ paving materials will improve the appeal of the street and create a unified appearance along Shaw Road and Heaton Moor Road. It will remove the patchwork of infill tarmac along Heaton Moor Road pavements and do better justice to the beautiful buildings in the conservation area. Street Trees: The introduction of street trees where services allow will add warmth and character to the streets. Alterations to parking arrangements: The new street layout will help to reduce speeds as cars enter Shaw Road from Heaton Moor Road. It will increase the priority to pedestrian use along it and the removal of spaces on one side of the road allows a better alignment for traffic to operate along it. This does mean the removal of approx. 6 car parking spaces on Shaw Road, but we feel that the benefits of an upgraded streetscape on Shaw Road far outweigh the loss of these spaces. The 4HTA are fully behind this project, but as the details of the project have become more widely publicised, a number of concerns and questions have been raised, mainly on social media sites. We’d like to address some of these concerns here. What about the rest of the Heatons? This is a pilot project, and the idea was envisaged for Heaton Moor because the area Nick lives in is Heaton Moor. He’s not charged for his services, and stands to benefit from the implementation of this project as much as any other resident in the area. The 4HTA is a voluntary organisation made up of local traders, and as such does not have dedicated resources looking at projects like this. It’s down to individuals to make things happen and take support from the 4HTA as required. The members of the 4HTA from all areas are watching this progress of this project with interest. A successful outcome will hopefully spur on residents, businesses and groups from other areas to look at making streetscape improvements in their own areas. Nick would be more than happy to assist with such initiatives, but he’s not able to pilot and project manage multiple projects like this at no cost. In recent 4HTA meetings, the topic of performing similar projects in other Heatons was raised, so you can be sure this is something that is being discussed and considered. Has funding been taken away from somewhere else for this? No! The council have explained to us that they segment their funding into pots for specific areas of spend. If a pot is not spent, the funds are not diverted to other areas. The funding for public realm improvements was already in place, and just needed to be applied for. By having a professional plan and sketches in place we’ve secured the funds for the Heatons rather than other areas of Stockport. Why haven’t I been notified? We held a public consultation on Shaw Road in the monthly markets early this year and now that the council have taken on the project they have written to local residents and businesses within an area they defined according to their procedures. The local businesses have been informed and involved with the process. 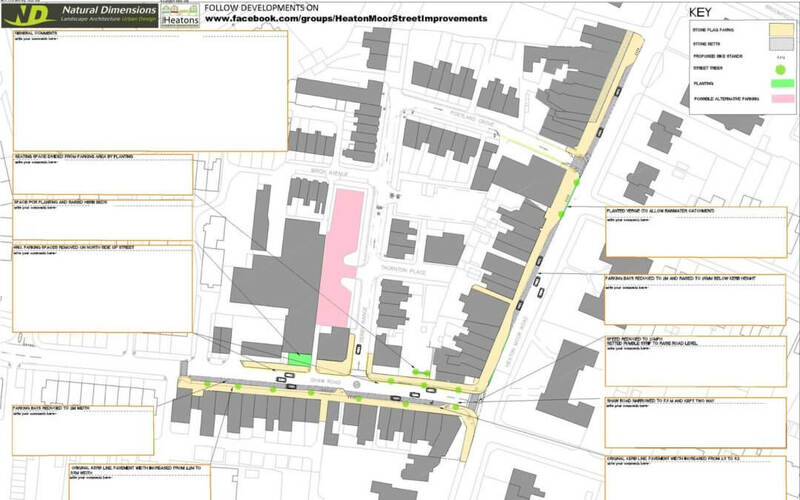 Please find attached a link to the plan showing the area which the Stockport MBC defined for public consultation. The scheme is a really great example of how effective our local community can be in making a tangible difference for the benefit of people’s lives and local business. The 4HTA supported this idea because it was felt that it would make a great difference to the area and the actions of the individuals involved promoting and developing this scheme in their own time is very creditable. Attached is a plan showing the area which SMBC did a hand delivered letter drop to. The council has had numerous responses by the deadline of 11th September which are now being collated. This will then result in a plan being put for recommendation at a planning committee. If you have any representations you wish to make positive or negative you should contact your local councillor who will represent your views as your elected representative.